This would always be something that boggled my mind. How uncanny and swell it feels to have someone run their fingers through your hair. Now, what I discovered to be the best way to enjoy such a treat is to be laying down, your head on the lap of the person treating your hair, all on a neat and comfortable sofa. It's even better when the person treating your hair is your significant other. It's become a sort of guilty pleasure of mine, but ____ didn't seem to mind satiating it, so I've never once minded or neglected the opportunity for it. Her fingers were just right too. Clean and slender, soft to the touch, making perfect strides through my hair. It was certainly soothing and it could definitely lull me to sleep. This was one of those little things I really enjoy. Walking along the abandoned snow-covered road, you found yourself lost. Again. 'Must be somewhere in the Northern states of the USA...' you thought to yourself, sighing, your breath fogging up the air surrounding your head. 'No... must be Canada.' You shivered; wherever you were, it was cold. The frigid wind whipped around your being, making you shiver to your core. Every now and then, a truck would pass by, and no matter how hard you tried to get their attention, they would just speed along as if you weren't even there. 'What I wouldn't give to be back home with my sisters.' You remembered your decent life prior to your most recent fight with your oldest sister. Before you could become lost in assessing your life, something snapped you out of your daze. A blurry figure appeared just up ahead through the snowstorm, and as it approached, the silhouette became more defined. “I hate this alarm clock. It drives me nuts!” you yelled in frustration. You threw your (f/c) pillow at it as the excessive chimes had stopped. “(f/n) Either wake up or shut up!” yelled a voice. 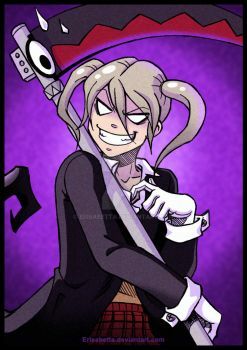 Today was your first day at the DWMA, Death Weapon Meister Academy. Students enrolled here fit into two categories: weapon or meister. Weapons are people who could transform into said object. Meisters are people who have excessively special wavelengths; they have the ability to wield weapons. You're a bit different than most people; you had both meister and witch blood run through your veins. Confusing, right? Witches are known to be wretched and nuisances to society. However, due to being part human, you actually had a heart; unlike witches and kishin eggs.